Your opinion matters. Leave A Review Or Edit This Listing for Round Rock Area Serving Center . 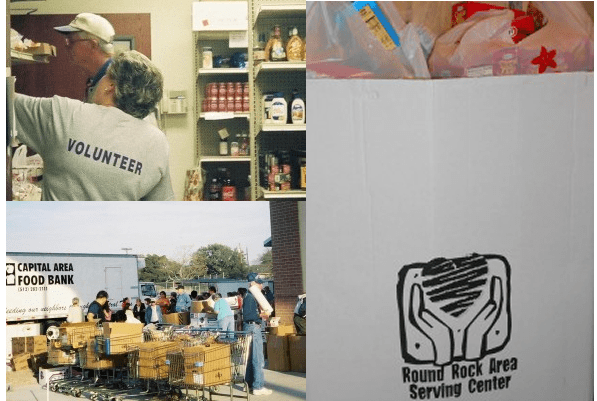 The Serving Center is a charitable social services agency and food pantry that serves the Round Rock, Hutto, Great Oaks, and zip code 78717 of southern Williamson County, and the Wells Branch area of Travis County. Program services include the food pantry, Keep Round Rock Warm coat distribution project, community gardens, Computers for Kids, clothing and furniture vouchers, adult computer classes, charity resale store, The Volunteer Center, and financial assistance toward rent, utilities, transportation, temporary lodging, and prescriptions. The food distribution program includes the food pantry, Fresh Food for Families, the HOPE program (a nutritional supplement for the elderly), and thirty four community gardens. Client families learn to grow their own food in the community gardens. The Treasures Charity Resale Shop and Boutique is open to the public. We always need more information on our pantries. If you know of any details, volunteer information, website, hours or more description information about Round Rock Area Serving Center please add a comment (below the map on this page), with information. We will then display this for all visitors on this page.